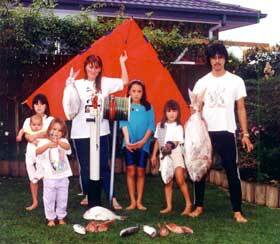 Kite fishing is an extremely productive shore based fishing method that allows land based fishers to regularly catch limit bags of snapper, kahawai, gurnard and trevally or to easily target kingfish and john dory from any of the numerous clear exposed beaches around New Zealand. For those fishing on or near reef or in areas where very strong rips occur specialist kitefishing Dropper Rigs are the only way of deploying multiple hooks well offshore without risking getting the mainline hopelessly snagged. Specialist kite rigs can also be used for casting separate lines out well beyond the range possible with surfcasting rods. There are two distinct methods of kitefishing, Bottom Longlines and Dropper Rigs each of which are designed to overcome specific obstacles to successfully fish well offshore regardless of where you choose to kitefish. For those thinking about trying out kitefishing it is worth considering the pros and cons of the different types and sizes of rigs for the areas you intend to fish. 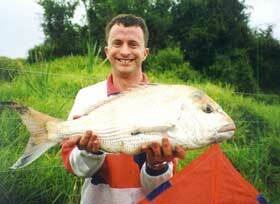 Reading the following will help you learn how to catch snapper, kahawai, gurnard, trevally and kingfish with the aid of a kite. The Bottom Longline method is similar to the old kontiki style of fishing. On Bottom Longlines a heavy duty mainline of around 80 to 100 kg nylon is required. Lines weaker than this are unable to safely take the inevitable nicks and scuffs the mainline encounters over time as it runs out along the bottom. The mainline is connected to the kiteline with a braided cord that has a flag sewn onto it. A two or four litre plastic bottle is attached to the braided cord and is filled with sand or water to prevent the kites from lifting the mainline and hooks off the bottom or out of the water completely in strong wind conditions. Traces and weights are connected to the mainline as the kite tows the line offshore. The weights, clipped onto the mainline in front of the hooks, ensure the mainline is held hard on the bottom maximising the rigs fishing efficiency and also preventing the metre long traces from wrapping around the mainline and becoming tangled during setting. The Bottom Longline is an ideal system for the east coast. This rig will tow out up to 25 hooks per set (the legal limit per longline) and while it is possible to operate a longline rig single handed it is much easier when two or more persons are involved. By far the easiest of the kitefishing methods to operate, the Bottom Longline must be used from clear snag - free areas and is very popular in areas such as Whakatane, Tauranga, Papamoa, Waihi, Pukehina, and Northland beaches like Orewa, Omaha, Pakiri, Te Arai, Uretiti and Tokerau. Many west coast beaches are also good for the Bottom Longline system such as Baylys Beach, Muriwai, Kariotahi, Port Waikato and Mokau but the west coast poses a few draw backs as well. 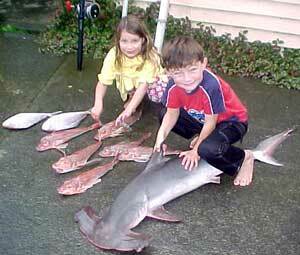 With its often high surf and strong long shore currents and its abundance of large sharks it can be quite challenging for a newcomer to kitefishing. By all means kitefishing with a longline on the west coast is feasible, and with experience can be extremely productive, but the ultimate rig for fishing this coast is the Dropper Rig system. 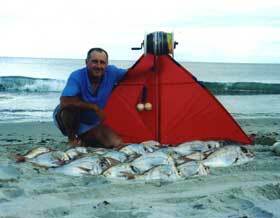 This style of landbased fishing is only practical with kites. The Dropper Rig method can be fished over clear sandy beaches, as with the Bottom Longline, but also can be adapted to cast out other lines, fish dhan lines or ledger rigs on or near reefy areas or troll for kahawai and kingfish. Basically, anything you could do from a boat can be done with a Dropper Rig from the shore. Unlike the Bottom Longline which requires the mainline to be a specific lineweight , small kite powered Dropper Rigs can be made up on as little as 8 kg line and run from a surfcasting rod right through to large kite powered rigs designed to tow out up to 20 hooks on 65 kg mainlines. All Dropper Rigs are extremely versatile in their uses. The basic Dropper Rig configuration has the mainline and kiteline supported clear of the water out to the fishing position. Fifty metres below the kite a separate line, (the dropper line) is attached to the braided cord junction that joins the mainline to the kiteline. The dropper line drops down to a plastic bottle that is weighted to prevent the kite from lifting the terminal tackle out of the water. The leader line extends from the bottle to the sea bed. The hook section, which is just like a mini longline, is connected to the leader line by a safety trace which should be no more than 80% of the breaking strain of the mainline. This safety trace offers additional protection for the kites and mainline should the kitefisher unwittingly be fishing over rocky areas with the wrong terminal tackle or happen to hook into a few large sharks or stingrays. If the gear is snagged or you hook something too big to land the safety trace snaps and everything except the hook section is safely recovered. Careful consideration should be given to the number of hooks set . If too many fish are caught you could risk overloading the breaking strain of the safety trace and losing your catch. Because the east coast and west coast fishes so differently it is safe to set more hooks on the east coast. For example, a 65 kg Dropper Rig could easily set up to 20 hooks per set on the east coast, sharks aren't such a big problem there, but the number of hooks fished with the same rig on the west coast should be reduced to 10 per set. This is by far the best system to use on the raging west coast as it is unaffected by high surf or strong rips. It's always a good idea to use the Dropper Rigs over clear snag free areas at least until you are familiar with how they operate and become proficient with this method of kitefishing before adapting the terminal tackle to fish the trickier areas such as near reef. Depending on the size of the Dropper Rig you choose, the ease of use will vary. Inevitably the smaller the rig the easier it is to handle by one person. Dropper Rigs are a little more complex than the Bottom Longline Rig but are undoubtedly the most versatile and safest of the kitefishing methods. The only draw back of a Dropper Rig is that when the rig is being used in areas where boats are present or where there is offshore reefs, the mainline must be kept clear of the water. It is critical that the kite you use is perfectly balanced with the weight of the mainline and number of hooks it is powering.